A Maß is the name for a mug that holds one liter of liquid. Maß is often used as an abbreviation for Maßkrug. 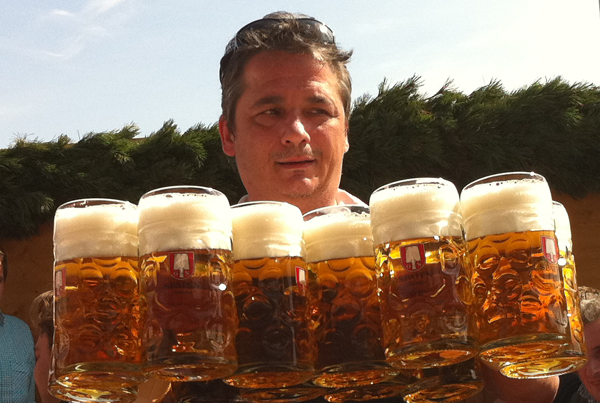 The Maß is the typical way beer is served at Oktoberfest. In the large tents, each Maß will carry the logo of the specific brand of beer that is served. Although the Maß looks like a great souvenir, do not try and steal them from the tents. There is security at the door checking for thieves and fines are possible. When ordering a Maß at Oktoberfest, be sure to address your server with the quantity of beers you would like to purchase and have the money ready, with tip, to give to the server. It is customary to include tip with your original purchase and not to ask for change then give them a tip. To order one beer, make sure to say "Eine Maß bier, bitte." which translates to "One liter of beer, please." Since Maß is referred to as female, whoever orders a Maß of beer as "ein Maß" instead of "eine Maß" would out themselves as a non-Bavarian.